It's December 1 and it's on! 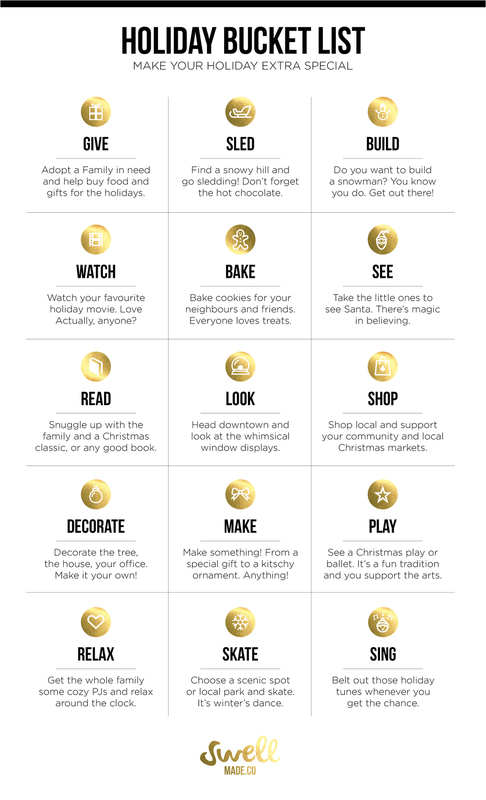 The holidays are here so we've created a bucket list to make your season extra special. Take time to focus on experiencing things with loved ones, supporting your community, relaxing and having fun. GIVE - There are endless ways to give in a city that gives us so much! Get involved with your neighbourhood community centre, school, church or workplace to Adopt a Family. This will have a huge impact on a family in need. The holidays can be a tough time, so help out. SLED - Head to Riverdale Park East on a snowy day for one of the city's best hills for sledding. The view of downtown Toronto from the park is worth the trip alone. Don't forget to warm up with coffee or hot chocolate at The Rooster House Coffee. A quaint coffee shop across the street. LOOK - The Hudson Bay Company does Christmas right. It has been for years. Make a trip downtown to The Bay on Queen Street West to see the magical window displays. Follow the story down to every last detail. If you want to live the high life, take in the sights on Bloor Avenue in Yorkville. SHOP - Toronto is a city of neighbourhoods. Support your community by shopping local. Shopping local benefits everyone, especially the recipients of your special gifts. There are also plenty of pop up markets in Toronto that provide local vendors and makers with an opportunity to share their wares. Check out the Toronto Christmas Market, #LocalTOMarket, Union Station Holiday Market, City of Craft... There are so many options and so many talented people. PLAY - Every year we find a way to incorporate the arts with the holidays. Whether it's the Young People's Theatre or the National Ballet. There's something for everyone and they often have added performances over the holiday season. Looking for a gift? Buy tickets or a workshop for someone special. It can be anything from a pottery class to an Indie concert. It's an experience they won't forget and Toronto has world-class options. SKATE - Our favourite places to skate in Toronto are City Hall (the scenic) and Greenwood Park (the local park). City Hall is beautifully lit and well attended, of course, but it's worth the view and experiencing the buzz of the holidays. Greenwood is a family affair with a newly built and Toronto's first covered rink. Stop at Brickyard Grounds for a warm up.